A 3'-5" opening is pretty small that almost any steel angle big enough for the veneer to sit on will work. Obviously an angle that is 2 inches or smaller will not work but an angle with 3 inch leg will work. The diagram below show a L5x3 angle. The determining factor in this case is the edge distance from top of angle and bottom of foundation. The reinforcements for the concrete may vary from one to two inches. 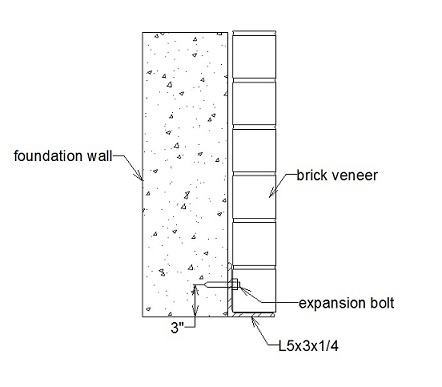 Using three inches will clear the concrete lintel reinforcements. Not only that we need to clear the concrete reinforcements, it is also important not to drill too close to the edge of concrete because the concrete will chipped and fall off. From top of the angle to the hole for the bolt, it will require one to two inches edge distance. Adding the two from top of angle and 3 from bottom is where the 5 inches come from. I personally prefer to work with 3 inches above the door or window opening when drilling bolts for lintels because it's hard to keep the hammer drill straight. If the bolts can be installed during the pour of the foundations than a much closer edge distance from edge of foundations can be used. 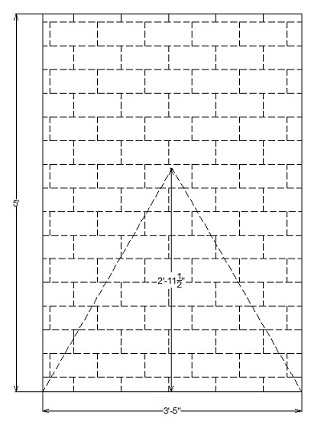 The weight of the veneer is distributed to the steel lintel in the form of an isoceles triangle as depicted by the triangle shown in the diagram above. As shown only a portion of the 3ft of the 5 ft veneer wall will be carried by the angle iron. The higher above the wall opening, the less load is being carried by the steel lint. Due to this load distribution, we can use much smaller angle as lintel. Since these steel lintels will be exposed to weather, it is recommended that they are galvanized.